A dead whale washed up on Revere Beach Friday morning. Mike Ciarlone (left) and his dog Humphrey Bogart got close for a look. Two dead humpback whales washed up Friday morning, one in Revere and one on Little Brewster Island near Boston Light, officials said. A dead 25-foot-long humpback whale washed up on Revere Beach before 7:30 a.m., and officials believe it is the same whale that was towed into the ocean exactly one week ago, after it washed up in Cohasset on Sept. 9. A team of biologists from the New England Aquarium recorded initial observations and measurements of the whale when it first washed up earlier this month, but additional evaluations may not be possible, said Jennifer Goebel, a spokeswoman for NOAA Fisheries. 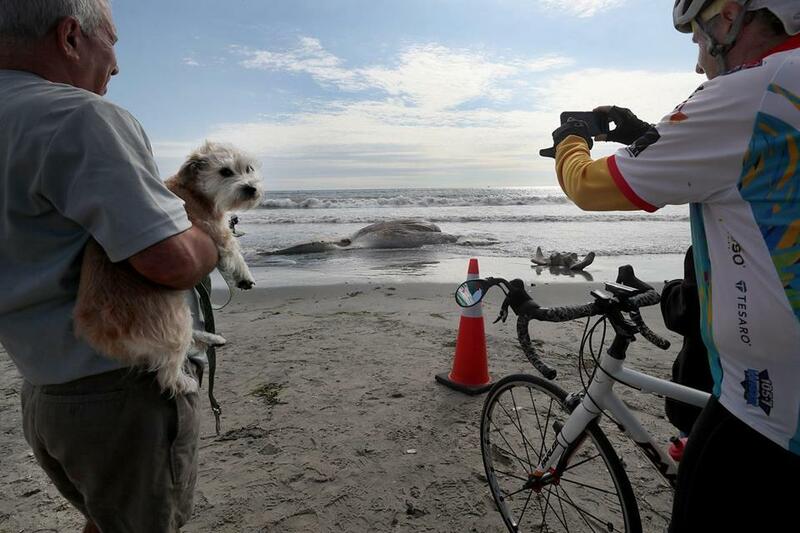 “The whale is very decomposed, so we are not planning any more sampling,” she said. Tony LaCasse, a spokesman for the New England Aquarium, confirmed that the aquarium team is no longer involved with the whale, as there is no more biological work left to do. State Police said the juvenile whale would probably be buried on the beach Friday, after the tide recedes. NOAA Fisheries is working with the state’s Department of Conservation and Recreation, which manages the beach, to find an appropriate way to move the whale, officials said. In Boston Harbor, a humpback whale washed up near Boston Light on Little Brewster Island. The carcass was caught on a rocky part of the island that was accessible only at low tide, LaCasse said. Biologists from the aquarium took measurements of the whale’s carcass and tissue samples on Friday. The carcass of the whale, a 50-foot-long adult female, was “quite bloated,” and aquarium biologists thought it had been dead for several days, said LaCasse. Its tail was wedged in between rocks, and biologists had a difficult time accessing the carcass in part because surrounding rocks were covered in whale oil, said LaCasse. “This is a female and it’s a big female,” he said. From what the scientists could see, there was no evidence of entanglement or open trauma from a possible vessel strike, said LaCasse. Biologists have yet to identify the whale. LaCasse said most of the humpbacks in the area are “quite well-known” to researchers. The whale had been seen floating near the island Monday, Goebel said. Several whale species have been dying at an unusually high rate since at least 2017 as part of three ongoing unusual mortality events. At least five whales have been found dead around the Northeast since Sept. 9. Two dead minke whales were found floating in the waters off Gloucester and Sea Bright, N.J., last week. Another minke whale washed up in Rye, N.H., on Monday. The National Oceanic and Atmospheric Administration has declared an unusual mortality event for humpback whales along the Atlantic Coast. Danny McDonald can be reached at daniel.mcdonald@globe.com. Andres Picon can be reached atandres.picon@globe.com.